Are you in the market for heart rate headphones, but aren’t sure which ones to buy? In this buyer’s guide you’ll find the top heart rate headphones in the market. We have done the research and selected the best ones based on many important factors. A buying consideration section is included in this buyer’s guide to help you figure out the best headphones for your needs. This section includes factors such as comfort, brand, audio quality, durability, and wireless connectivity. Take each buying consideration into account to end up with headphones that match your needs. We had a blast writing this buyer’s guide and are confident you’ll learn what’s needed to make a smart choice. Read the guide until the end to have a good overview of the heart rate headphones buying guide. Integrated 8GB MP3 player and pre-loaded with training plans. Has an 8 hour reliable battery life and sweatproof. Secure fit, industry-leading brand, and NFC pairing. Frequency response: the human ear can hear in the range of 20-20KHz, which means this is the range you should aim to have in your headphones. A wider range is better since you’ll enjoy deep bass and better vocals. Audio drivers: larger audio rivers lead to louder music, and they are measured in mm. The materials used to construct the drivers play a role in determining durability and audio sophistication. Noise isolation: the majority of earbuds in this buyer’s guide come with natural noise isolation due to the in-ear design. It’s an important design feature that helps keep out ambient noise. Consequently, audio clarity is maintained so you can enjoy your music. In this buyer’s guide, you’ll find a mixture of popular and unfamiliar brands. It’s a smart idea to execute background research on brands you’ve never come across before. It allows you to get familiar with their design choices and philosophy as a company. You‘ll also learn about brand specific features and their customer service care post-purchase. Buying from industry leaders like Bose is a no-brainer since you can expect features that are competitively implemented. 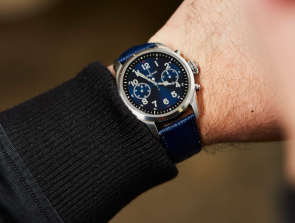 The attention to detail and build quality is what stands out from the top brands in the marketplace. Ear hooks: the majority of heart rate headphones are designed for sports enthusiasts, which means they have features like ear hooks to provide a stable fit. Ear hooks latch onto your ears to prevent dislodgement while moving your head. Eartips: brands tend to include at least 3 eartip sizes so that you’re able to get a fit that matches your ear size. Correct ear tip size contributes to better noise isolation, which in turn maintains audio clarity. Furthermore, it’s preferable when you have a choice of eartip materials to choose from. You can buy additional eartips when the originals have worn out. Wireless connectivity: headphones with wireless connectivity means there are no wires that can get in the way of movement. Therefore, you can move around while exercising without being frustrated by wires that can rip out the earbuds from your ears. Headphones that you use for exercise should be durable so that you don’t accidentally break them shortly after purchase. You can take a look at high-resolution images to get an idea of what materials are used. You’ll also notice the design type, which you can make judgments about with regards to durability. All product descriptions nowadays have several zoomable images that do a good job of clearly displaying the headphones. Sweat-proof headphones are a must for sports enthusiasts. A coating is applied that blocks out moisture, which protects the audio drivers from damage. An IPX4 rating is desirable since it means you can use the headphones in the rain. Furthermore, take a look at the warranty deal to see the length of coverage and the covered damage types. Brands that have trust in their headphones won’t hesitate to provide a good warranty deal. 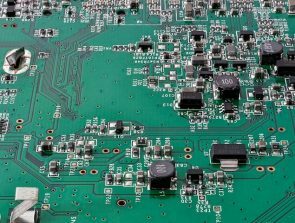 Battery life: do you hate battery maintenance? Then look for headphones with longer battery life to avoid constant recharging. Some headphones like the Jabra Elite Sport True come with a charging case that allows you to easily charge the headphones while on the move. Bluetooth version: check the Bluetooth version to see if an up to date version is used. Bluetooth 4.0+ is ideal since the range is 33 feet and offers reliable connection quality. Quick charge feature: some headphones offer a quick charge feature that enables you to receive running time for a short period of charging time. It’s a useful feature when you have unexpectedly run out of battery life. MP3 player: headphones with an MP3 player allow you to store music so there is no need to have a smartphone around. In this buyer’s guide, you’ll notice storage sizes of 8 and 16GB, which is more than enough for thousands of songs to be stored. Fitness app: supplementing your fitness sessions with an app can improve performance, motivation, and get to your goals faster. An app can help you track several aspects of your fitness training and give you suggestions on how to improve moving forward. Sweatproof: an IPX4 rating is desirable for heart rate headphones if you’ll be using them for exercise. That’s because it ensures they are sweatproof and can be used in the rain. In this price bracket, you’ll find highly rated heart rate headphones that have good durability, a comfortable fit, and competitive audio quality. The battery life is also decent here, which allows you to enjoy the audio for the majority of the day. However, for more advanced features check out the pricier category. There you’ll find improved audio quality and features that are designed to accommodate the sports enthusiast. The VI Sense Wireless is a good choice for buyers that need a built-in fitness tracker and heart rate monitor. A bunch of practical features are implemented here that allows you to use these while exercising. Read up on the features carefully to determine if there is enough value for your needs. The sweat-resistant design means you can use these while exercising without worrying about moisture damage. Furthermore, they won’t get damaged if you want to go for a jog in the rain. This gives you the peace of mind that durability is not an issue while working out. Sophisticated biosensors are installed that do a good job of accurately monitoring your heart rate. You’ll get accurate readings throughout the workout so you can keep an eye on progress and your well-being. 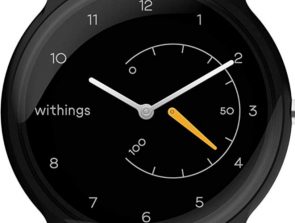 The fitness tracker is built with sports enthusiasts in mind. Real-time audio feedback is provided while you’re working out. This can motivate you to go harder for longer if motivation is one of your weaknesses. Furthermore, a custom workout plan can be created on your smartphone, which can be connected to via Bluetooth. The VI Trainer app has a straightforward interface that allows you to customize a plan to fit your specific goals. The Bluetooth connection provides 8 hours worth of battery life and you can take calls via your smartphone. Therefore, there is no need to stop your exercise session when you want to accept an important call. The in-ear fit means these headphones won’t come loose when moving your head around. Also, the ear hooks do a good job of providing a secure fit that will keep the headphones in place when you are on the move. The VI Sense Wireless comes with a few drawbacks that you should consider before moving forward. Firstly, the microphone can be patchy, which means you may need to repeat yourself to be heard. Also, the around-the-neck headband can be somewhat bulky for users that are used to a minimalist design. 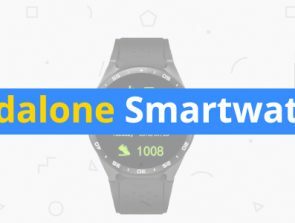 To conclude, the VI Sense Wireless is a solid choice for sports enthusiast that wants decent battery life, a secure fit, and reliable heart rate tracking. Furthermore, the app adds a lot of value since you can create a custom plan that puts you in the best position to meet your goals. The KuaiFit Sport Headphones are designed for sports enthusiasts that want excellent durability, a secure fit, and useful features. If you want to monitor your progress while exercising, then these are for you. The built-in heart rate tracking systems work accurately. Read on onwards to learn more about the features implemented here. There is an 8GB internal storage unit that can be used as an MP3 player. Use this to store music, so there is no need to connect to a smartphone to stream audio. However, you can make use of the Bluetooth connection to access audio emitting devices. The wireless connection means you don’t have to be limited by a wire when moving around. They are designed to be used while exercising, which means they are sweatproof and durable. Dropping them on the floor or accidentally squashing them will not result in damage. Therefore, you can also use these while traveling or in extreme weather conditions. They are preloaded with 2 months worth of training plans, which is a bonus for exercise enthusiasts. Also, the heart rate monitor is clinically validated, which means you can expect good accuracy. They are useful for individuals with heart problems or those that want to monitor the progress of their training. Before buying the KuaiFit Sport Headphones take a few moments to consider the drawbacks. Firstly, the audio quality is not the best at this price. You’re mostly picking these above other options for the extra features. 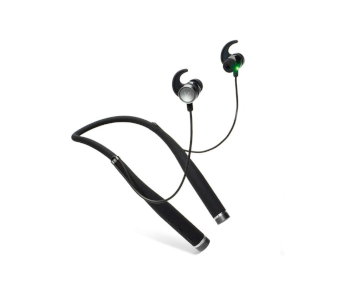 Also, they are relatively bulky for around the neck headphones that are built for exercise. To conclude, the KuaiFit Sport Headphones are a good choice for sports enthusiasts that want durability, practical features, and an integrated MP3 player. You’ll love using these whenever you need audio on the move. However, be prepared to sacrifice audio quality at this price compared to competitors. Do you have a premium budget and are looking for the best heart rate headphones in the marketplace? Then you’ll love the options in this price category due to the advanced features. You can enjoy up to 16GB of internal storage, well-implemented fitness apps, and a durable build that’s designed for sports enthusiasts. However, they are pricey so you’ll need to be sure that the quality here matches your requirements. Bose is an audio industry leader you may have come across before, or even own some of their products. The SoundSport Pulse is designed for the modern sports enthusiast that wants the best of what earphone technology has to offer. They have a sport visual design and provide a secure fit. Read the features carefully to determine if they are a good match for your exercise habits. A secure and stable fit is provided by the Bose SoundSport Pulse, which allows you to stay comfortable during the exercise session. They won’t fall out unexpectedly so there is no need to adjust the fit constantly. They are also relatively light, which means you’ll quickly get used to wearing them. The Bose Connect app gives you heart rate readings in real time. Therefore, you can monitor the progress of your exercise session as it’s taking place. The app also allows you to adjust the Bluetooth connection. The battery life is a reliable 5 hours, which is short when compared to most other earbuds. Also, there is an NFC pairing feature that allows you to forge quick connections with compatible devices. Simply tap them together and you’re good to go. The IPX4 rating means they are sweatproof and can handle light rain. Furthermore, the strong durability means they won’t break after only a few months of use. They are the ideal choice when you need a daily partner for your intense exercise sessions. Before adding the Bose SoundSport Pulse to your shopping cart consider a few of the disadvantages. Firstly, there are other entries on this list that cost less and provide comparable value. Also, there is no dedicated fitness app so you’ll need to download one. To summarize, the Bose SoundSport Pulse is a worthy purchase for exercise fanatics that want audio from an industry-leading brand. You’ll love these if you need a reliable heart rate monitor, a sporty look, and good Bluetooth implementation. However, the high price and short battery life are something you need to take into account. 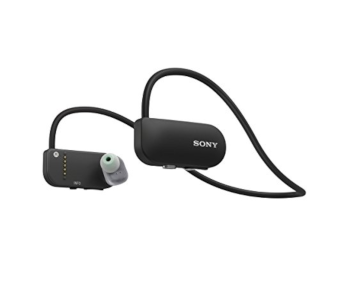 Sony is an industry-leading brand that consistently releases highly rated headphones. The attention to detail is impressive, but the price tag is high so you’ll need to give them a good dose of scrutiny. Take a few moments to look at the features carefully and judge if there is enough to justify the asking price. 11 measurements are tracked with these headphones, which includes heart rate, calories burned, strides, steps, pitch, pace, speed, time, and distance. You can use the data to assess how much exercise you’re doing and if your goals are being met. The data can be used as a source of motivation since you can aim to push yourself even further. You can view your jogging route graphically via the Smart B-Trainer app. Using the app you can also plan jogging routes and perhaps uncover new ones in your local area. 8 built-in training plans are included that can be used to give yourself a fitness plan of action. A 16GB built-in storage unit is included that can be used as an MP3 player. Therefore, you can store music within the headphones, which eliminates the need to have an audio emitting device nearby. It’s practical when working out and you don’t want to carry around a smartphone in your pocket. The headphones are waterproof and washable. Therefore, you don’t have to worry about water-based damage. You can be dripping in sweat or jogging in the rain without the audio drivers wearing out. Also, you can clean the headphones with a good dose of water without worrying about damage. It’s handy after an exercise session since the headphones might be dripping in sweat. Take a few moments to consider a few of the drawbacks before proceeding with the purchase. Firstly, the bulky earcups might not be ideal for users that are used to a minimalist design. Also, the premium price tag doesn’t represent the best value for money in the marketplace. To conclude, the Sony Wireless Sport is the right choice for buyers with a big budget. You’ll love these if you want a premium brand, a good quality trainer app, and a built-in MP3 player. However, it’s the most expensive heart rate headphone on this buyer’s guide, so make sure you’ll utilize the quality that’s available here. 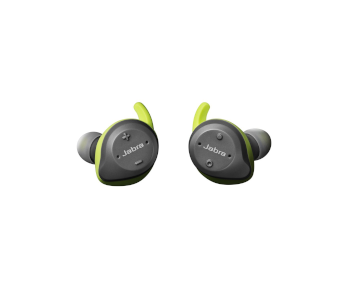 The Jabra Elite Sport True has a premium price, but the advanced features mean it’s justified. 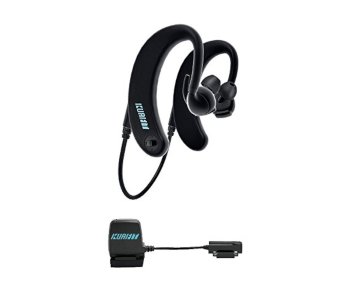 You’ll love these if you need a lightweight design, advanced fitness features, and reliable Bluetooth connectivity. They are built with the fitness enthusiast in mind, but they are also suitable for users on the move. Delve deeper into the features offered to figure out if these are the right choice for your needs. The battery life is a solid 4.5 hours and there is a charging case that provides an additional 9 hours. The case is handy when you need to store the earbuds in a safe place between audio sessions. Up to date Bluetooth is implemented, which means you can enjoy a range of 33 feet and reliable audio quality. 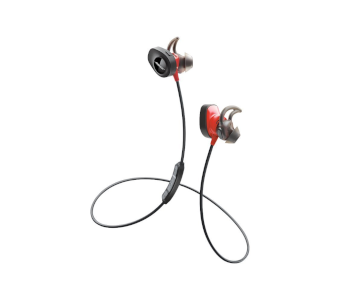 The lightweight earbuds are angled for a comfortable fit and earhooks are included. Therefore, these earbuds won’t come loose after moving your head during an exercise session. Furthermore, they feel premium in-hand, which is to be expected at this relatively high price. The heart rate monitor is integrated with an app that can be used to view the readings in real-time. Therefore, you can view the progress of your exercise session for immediate feedback. Tracking and analyzing your data can help improve future exercise sessions. The app can also be used for automatic rep counting and gives you recovery advice. Before proceeding with the purchase consider a few of the drawbacks that could be a deal breaker. The short battery life per charge might not be what you’re looking for if you need continuous all day usage. Also, they are expensive and there are comparable cheaper versions that allow you to save money. To summarize, the Jabra Elite Sport True is an excellent choice for those that require a well-implemented fitness app and a minimalist design. Those with a premium budget will appreciate the sophistication and implementation of the design here. However, you’ll need to deal with the limited battery life.